Travel about 8,200 miles east from Abilene, Texas, and you will find yourself in a land home to some of the tallest and most scenic mountains in the world. The breathtaking views of Mount Everest and other fabled Himalayan peaks are what draw hundreds of thousands of tourists to Nepal each year. 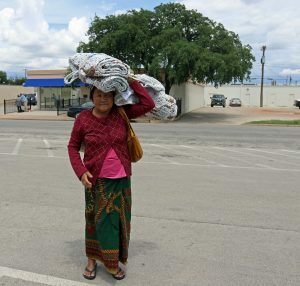 "It was beautiful," refugee Phisty says of the eastern Himalayas, where she lived most of her life before moving to Abilene. Beauty, however, is relevant to the beholder's perspective. When interethnic conflict escalated in Bhutan in the early 1990's, Phisty was among the scores of Nepali language-speaking Bhutanese people deported to Nepal, where they registered in refugee camps. "A lot of these people were landlocked between Bhutan and Nepal in these refugee camps," said Eternal Threads volunteer Carolyn Dycus, who helped found a program to benefit Nepali and Bhutanese refugee women living in Abilene. "...and they weren't nicely treated." Lacchi also lived as a refugee in Nepal, and she and Phisty agree life is better in Abilene. "They did not have money of their own," translator BJ said while paraphrasing Lacchi's description of the difficulties she faced living under refugee status in Nepal. The International Rescue Committee intervened, helping people like Lacchi and Phisty resettle and establish a new life in the United States. Now, Lacchi is taking English classes at Alta Vista and is working to earn her own income. The opportunity to make money is thanks in part to a program at local nonprofit organization Eternal Threads that Dycus helped found in 2014. "We call it 'Plarning for Abilene.'" "Plarning" is similar to the crocheting that the Nepali refugee women learned to do when they were young, only they use plastic instead of yarn to make mats that are distributed to homeless shelters in Abilene. Highland Church of Christ helped fund the program at its inception, and The Community Foundation of Abilene awarded a grant to Eternal Threads during CFA's 2017 spring discretionary grant cycle. Models and organizers at the Perfect Fit for Giving Style Show, wearing styles from Casa Authentique. The IRC helped identify eight refugee women to benefit from the program. This group of older women is unable to work in most public places due to the suppression of education in Bhutan and the refugee camps in Nepal. The women earn a modest stipend of $15 each for spending two hours a week at the Eternal Threads warehouse cutting plastic bags into strips. They take the strips home and crochet the mats on their own time. "They are donating," Dycus said. "I mean, this little bit that we pay them for two hours is just for them to have access to the materials and for socialization and for our mutual camaraderie." To much of the western world, it might seem as though these women have very little. Observe the smiles radiating from their faces and the warmth that pervades the room where they gather, and the perception will quickly change. "I am very happy," Phisty said using her burgeoning English language skills. And that, a beholder could surmise, makes the 8,200 mile trek from the towering peaks of the Himalayas to the humble plains of west Texas beautiful.